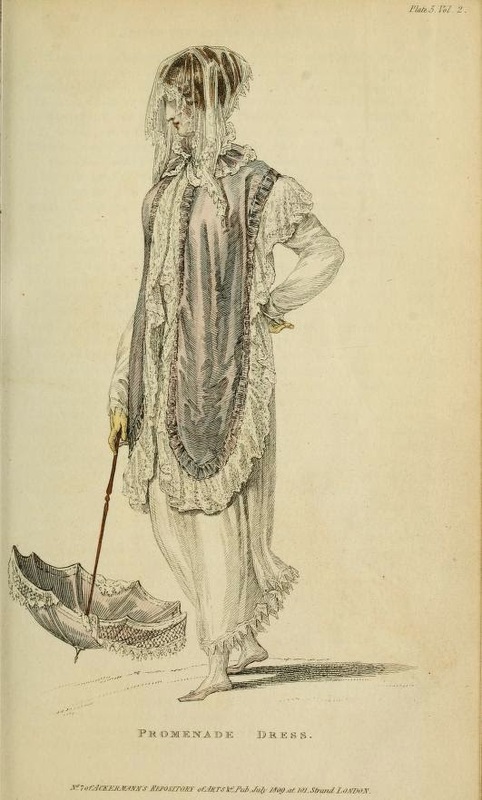 Today's fashions come from the July 1809 edition of Ackermann's Repository. 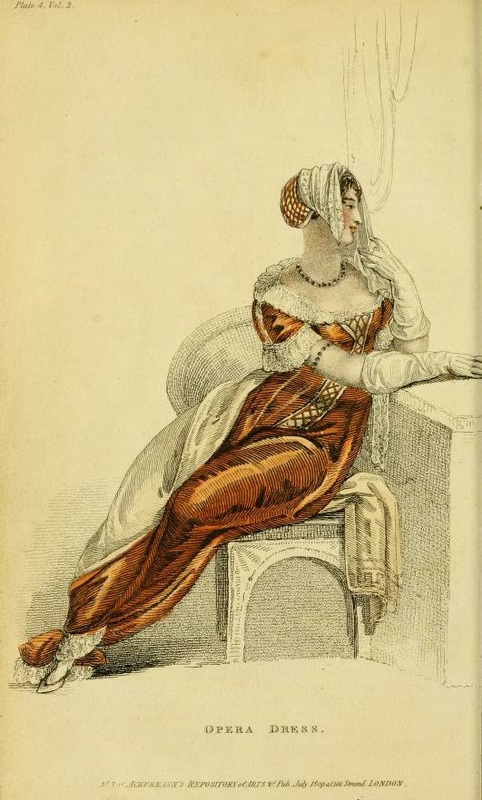 A round convent robe of Egyptian brown tissue, worn over a white satin under-dress, ornamented at the feet, and round the bosom and sleeves, with a broad antique lace, put on rather full, and brought to the narrowest dimensions in front of the bosom. White satin appliquéd stomacher, embellished with gold lattice-work, and continued in a straight line down the front of the robe to the feet. Head-dress, a gold net caul, inclosing the hair behind, and finished in front with a Mechlin veil of uncommon delicacy, disposed in graceful negligence, so as to display the hair on the forehead, and falling over the left shoulder. Necklace and armlets composed of a single row of fine Bohemian pearls, with topaz or diamond snaps. A Grecian scarf of rich Andalusian silk, happily contrasted with the colour of the robe, and wrought at the ends in a deep Tuscan border of gold or coloured silks. White satin slippers, trimmed with brown foil or gold. Gloves of French kid. Opera fan of white crape, decorated with a border of jessamine. A round high frock of fine French cambric, or the most delicate plain muslin, trimmed at the feet, wrists, and throat, with a fine Vandyke lace; the bosom formed in alternate stripes of footing lace and needlework. A Tyrolese cloak, of shaded lilac sarsnet, edged with Venetian binding, and terminate with a trimming of broad white lace, put on full. A double frill of the same round the throat, clasped in front with silver or cut steel. The hair dressed compact, in Grecian style. A veil á la Maltese, of the most transparent texture, edged in rich Vandykes, is thrown with simple elegance over the whole, softening the countenance which it partially displays. Sometimes the head is covered with a small French cap of silk, the same as the cloak, or of a well-contrasted colour. Parasol to correspond with the cloak, with deep white Chinese awning. Slippers of the same, or of lemon coloured kid. Gloves, Limerick or York tan. The most fashionable colours for coats are olive green, dark blue, and black, with covered buttons, long waists, broad at the bottom and short at the skirts, double breasted, with pointed lapels, corresponding in length with the hip buttons. The collar is worn high behind, and to come down low in front. Sleeves long, with round cuffs, and pockets under the flaps. White Marcella waistcoats, and light-coloured single cassimere breeches, worn long. Mixed, bottle-green, Vandyke brown, and Spanish blue are the most prevailing colours for morning coats. They are made in every respect the same as the dress coats, except that they have gilt basket buttons, sleeves with slits and three buttons, and pockets in the plaits of the skirts. Waistcoats, shawl pattern and various striped marcellas; light-coloured double-milled cassimere pantaloons and half-boots, or nankeen trowsers and gaiters. We must not omit noticing this place an ingenious article just invented, called Key’s travelling waistcoat, which by folding answers the purpose of two waistcoats. It may be made either single or double-breasted, and of any article.